Submitted by Norm Roulet on Tue, 07/04/2006 - 11:28. December 7, 2001, was the greatest independence day in the history of Cleveland, when a hopefully new real NEO economy received the greatest gift imaginable with the closing of the toxin-spewing 1,200 acre LTV brownfields in the flats. This gave NEO's 1,000,000s of citizens independence from asthma and cancer and the freedom to breath clean air, redevelop a new city worth of prime real estate where the sprawling LTV-cyst finally sat idle, and the opportunity to resuscitate entire communities in the former LTV pollution fall-out zones spanning from Central and Slavic Village east to Brooklyn and Valley View south to Tremont and Ohio City west, literally saving the lives of 100,000s of our citizens and making Northeast Ohio more attractive to all who seek a good home and place to raise children. The freedom to breath was felt immediately, and for six months Northeast Ohio was a far better region. But the politicians and industrialists would have none of that clean air and good health for their people - they marched across bridges, held town halls and plotted, and venture capitalists swooped into Richfield with promise of foreigner-charity, and $ billions changed hands at huge profit to a few, and in a few wretched years we went from enjoying the gift of breathing the cleanest air in our modern times to suffering from the worst imaginable health conditions, with steel literally raining on our communities, and unimaginably worse toxic blight expectations ahead. The promise to the citizens in all of this was that it would "save" 3,200 good jobs, which it certainly did not... it seems there are now around 1,200 Clevelanders working for the now-Indian-billionaire-owned hell-furnace and they are far from treated well, and have far from good jobs. What was preserved in all of this was great wealth for those in shipping, and port operation, and trucking, and railroads, and perhaps fast food and some service sector businesses in the periphery of the toxic site. But at what cost to the neighboring businesses, the plant workers, and the rest of the region? The Cleveland Works is the single largest polluter of the air and water in Cuyahoga County, according to reports submitted to the Ohio EPA. It released 76 million pounds of air pollution in 2003 (Source: ISG 2003 Title V fee emissions report).The plant sits on the Cuyahoga River, and discharges 100,000 pounds of pollution into the river (Source: Ohio EPA Toxics Release Inventory, 2001). New data submitted to the Ohio EPA show that the asthma and cancer-causing pollution has risen over 30% from 2003 to 2004. Because the plant is so close to Lake Erie, both its air and water pollution can endanger the lake. Since the steel mill reopened, pollution problems in nearby neighborhoods have included metal flakes and soot covering people's cars and homes, nauseating odors including strong sulfur smells, loud noises, and visible orange and yellow clouds coming from the stacks. Obviously all these toxins and those emitted but not mentioned here travel great distances in our air, slowly killing everyone in the surrounding neighborhoods - certainly, the closer to the toxic zone and the more in direct pathways of airflows and so the fallout the worse. Looking at the tight satellite hybrid map of the Mittal site and surrounding areas above (larger view here - 560k) one sees the neighborhoods most immediately impacted by Cleveland Works fallout, including Cleveland Mayor Jackson's Central and Slavic Village to the east, which seems most in the site's prevailing winds) and up and coming Tremont to the west, where developers build condos literally with views of this ecological disaster. As the population of Cleveland is about 500,000, that is the number of most immediate victims of Mittal. Likely outcomes for those victims are asthma and cancer, which will reduce their life expectancies to some degree, and earning potential, and healthcare costs, and property value. For the sake of illustration, I'll suggest the life-long exposure impact results in a reduction in quality of life and/or life expectancy of 5 years per person, making the tight-community generational impact of Mittal on Cleveland longevity a reduction of 2,500,000 full time equivalent life years. Further, just for illustration, the earning potential per life year eliminated can be estimated at $20,000 per year, so the generational negative impact of Mittal on the tight economy, just in lost earnings (and so spending in the community) is around $50,000,000,000 (that's billion). Further, it is safe to say each person impacted will have higher medical costs to themselves, employers and society, for treating cancer and asthma alone, which I'll conservatively project at $100,000 per person over their lifetime, impacting 500,000 lives, or a generational cost in increased healthcare burden of $50,000,000,000. Further, it is safe to say the public awareness of this health hazard prevents most people from considering living anywhere near this pollution, reducing the value of all property in the areas impacted by a significant percentage, even factored for some positive value to society in lower rental costs for renters willing to live around there. If the negative impact is 25% subtracted from the value of 100,000 properties, and the average cost of a property in Cleveland is $100,000, then the additonal negative impact of Mittal on property values is easily $25,000,000,000. millions of pounds of pollution pumped into the Cuyahoga River and so Lake Erie, never to be removed from there or our community's greater Cleveland public water works. This cost to society per job at Mittal, for a generation of 1,200 workers, therefore far exceeds $100,000,000 per employee. At $50,000 per per Mittal employee pay per year, over a 40 year generational life working at the Mittal works, the generational pay to employee and so possible lifetime positive impact spent in the local economy would be about $2,000,000, being $98,000,000 less than the generational cost to everyone else in that immediate economy. But those are just some of the costs of Mittal to our economy, and the quality of life of today's generation. This does not consider reduced value of property and business opportunity throughout all of greater Cleveland, or the lower earning potential and so economic impact of everyone here, who have less overall economic opportunity in this less desirable regional economy, nor the lost opportunities of new economy businesses that would never consider locating near a steel mill, and the smart people who would never live near a steel mill, and it is safe to say the fallout from "Cleveland Works" spreads much further than just a few miles, and a wider perspective below would indicate danger and economic harm across all of Cuyahoga County, including the inner and outer ring suburbs, from Rocky River west, to Independence south, to Pepper Pike east, and all surrounding counties that we call our region. To make a conservative estimate of that negative generational impact on our region, just of this one steel mill... "Cleveland Works"... just double or triple the conservative immediate neighborhood cost of $125,000,000,000 and you'll realize the burden on your society in your lifetime in REAL NEO could be as much as $1,000,000,000,000 - that's $1 trillion. But at least we made a few venture capitalists very rich, and the world's reportedly third richest person much richer, and in Cleveland that is what we call a major victory for the regional economy. I call that a disaster highlighting the failure of all supoosed leaders of everything here, and all their followers, and I propose we start working as an activist community to eliminate Mittal and Cleveland Works and all polluters large and small from our region. A good place to begin is by visiting and supporting Ohio Citizen Action here. Much of Cuyahoga County and our 2.4 million person population is within a few miles of Mittal and the tons of pollution it spews on our residents.. do you live, work or play on this map (larger view here - 480k)? And here is the likely fallout path on you today, Independence Day, July 04, 2006, as of 5PM. How are other steel towns doing it? Submitted by Evelyn Kiefer on Tue, 07/04/2006 - 16:13. I have visited many big cities throughout the world, and I am wondering what other examples there are of cities that have such egregious polluters right downtown? What have other cities done to reconcile the need for jobs with the desire to put an end to toxic old industry? Please post any examples of cities that have been more succussful with this than Cleveland. 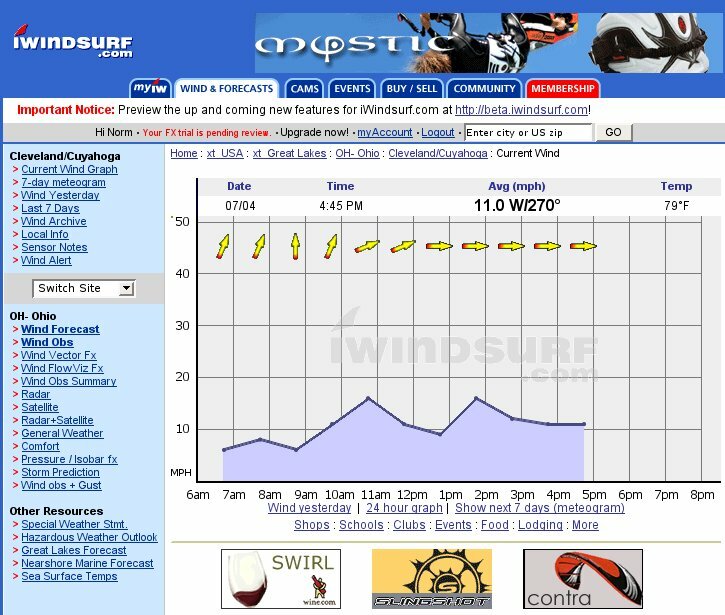 Wind direction and speed: do you live, work or play here? Submitted by Norm Roulet on Tue, 07/04/2006 - 16:24. To help you determine your position relative to the prevailing winds in NEO, here is National Weather Service data presented by iWindsurf.com (free membership required)... the greatest concern from Mittal Cleveland Works air pollution is certainly to the east, southeast, northeast, and downtown. 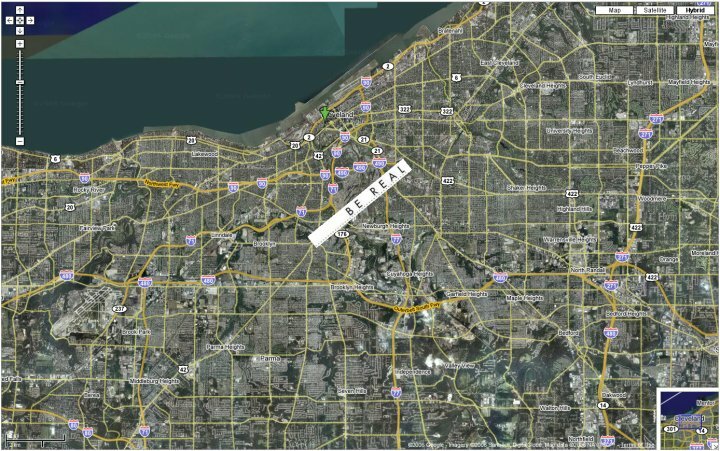 The greatest concern for water pollution is certainly right down the Cuyahoga River, where Wolstein plans to plant 100s of fancy condos, and along the near lakefront, like where the Port wants to direct much new development, and at nearby beaches like Edgewater Park, and of course Whisley Island. Submitted by Norm Roulet on Tue, 07/04/2006 - 17:23. After paying $4.5 billion to buy ISG and paying himself a $2 billion dividend for forming Mittal Steel, Lakshmi Mittal has announced no long-term capital commitment to build new steel capacity and has undertaken only one major project to replace aging equipment at his U.S. mills. This runs counter to statements by top executives (What They Said) that Mittal’s acquisition of ISG would spur investment and preserve jobs and production in the U.S. The one major capital project completed by Mittal USA was conversion of a mothballed continuous anneal line to a galvanizing line at the Cleveland mill. The $70-million project – approved and started by ISG eight months before the Mittal takeover – was scheduled for completion in fall 2005. It was not opened until the last week of April 2006. The line has the capacity to roll 700,000 tons of galvanized hot-dip steel for the auto industry and will create 80 new jobs, according to the company. The opening of the new galvanizing line has resulted in the closing of AK-ISG Coating, another galvanizing plant in Cleveland. The plant employed 83 people last April (2005) when Mittal took over operations from ISG. Employment was reduced to about 40 people in mid-2005 because of weak demand from General Motors and Ford Motors. AK Steel Corp. was a non-operating co-investor in the plant. Between May 2005 and March 2006, Mittal Steel idled blast furnaces at Burns Harbor, Indiana Harbor, Cleveland, and Weirton, resulting in more than 2,000 “temporary” and “voluntary” layoffs that lasted from several weeks to many months. 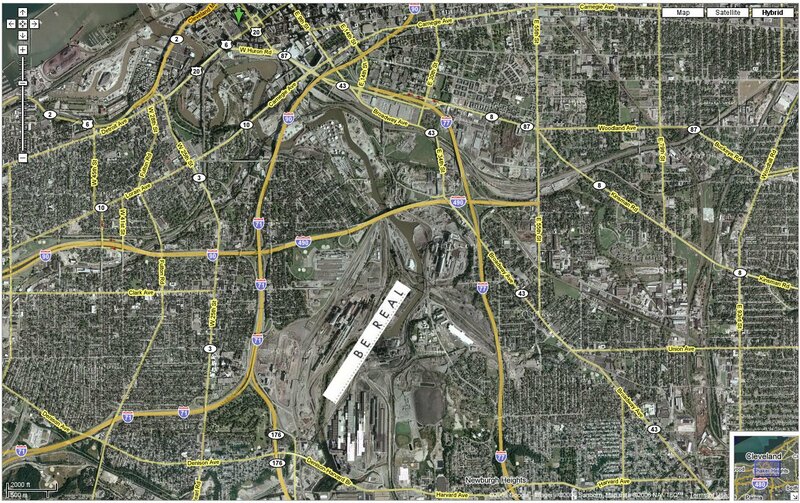 In July 2005, Mittal scrapped plans developed by ISG for a $200-million expansion of the Riverdale (Ill.) mill. “Their action is akin to a breach of contact,” Riverdale Major Zenovia Evans told reporters, saying she and other officials went to bat for the company with the Cook County Forest Preserve District to swap land to allow for the mill’s expansion. In November 2005, Mittal announced that it would not restart the blast furnace and steelmaking operations at Weirton, eliminating 800 jobs and 3 million tons of annual capacity. The company had reviewed a $93 million cost-cutting package that the union put together and found that it would not reduce costs enough to keep Mittal Weirton's hot-end operations open. In January 2006, Mittal announced that the number of job cuts at Weirton had grown to 950, including support staff. In February 2006, Mittal announced it would stop accepting orders for galvanized steel at Weirton and shut the galvanizing line within three months, eliminating about 50 jobs. Production of galvanized steel “causes the production line to run slowly, which [Plant Manager Brian] James said costs Mittal productivity and profit,” an AP article noted. In February 2006, Mittal idled several operation lines at Indiana Harbor, including the No. 4 pickling line and No. 56 tandem mill. Workers at the idled facilities would be moved to other jobs. In March 2006, Mittal moved forward – over union objections – to idle Sparrows Point No. 2 machine shop, eliminating 40 “temporary layoff” positions permanently. In March-April 2006, Sparrows Point’s modern in-line side trimmer for the No. 8 chrome line, mothballed by ISG, was shipped to Weirton’s No. 2 chrome line for installation. The removal of Sparrows Point equipment – without the apparent knowledge of USWA Sparrows Point Local 9477 – severely restricts the possibility of future chrome production at the mill. Rodney Mott, CEO of ISG and CEO-designate of Mittal USA, resigned one day before the merger. He was replaced by Louis Schorsch. Most senior executives of ISG left immediately after the merger, including the chief operating officer, chief financial officer, controller, treasurer, vice president of sales, and head of human resources. The exodus continues. Among prominent recent departures were the general manager of Sparrows Point (in March 2006) and the west regional director and ex-Burns Harbor manager (in January 2006). So far, Mittal Steel has maintained the good safety standards developed by predecessor companies and ISG. Serious accidents still take place in this hazardous line of work (a Mittal employee was killed at the Indiana Harbor plant last December), but Mittal’s reported rate of 0.79 accidents per 200,000 working hours is excellent. On January 1, 2006, about 2,500 foremen, supervisors, and other salaried employees at former ISG plants saw a reduction in their incentive and profit-sharing pay. “I will be losing $26,000 this year because Mittal has cut the incentive and the profit sharing for all salaried employees in the U.S.,” one employee noted. Other staff expect to lose as much as $40,000 in earnings this year. Negotiations are under way with the United Steelworkers of America (USWA) to modify incentive pay at some departmental units. The incentive plan was established under the ISG-USWA collective-bargaining agreement of 2003, which covered about 12,000 employees and which Mittal assumed with the ISG takeover. The contract expires on September 1, 2008. Several Mittal representatives met with Ohio Citizen Action members recently, but asserted that they had no power to undertake corrective measures and, in fact, did not have authority to spend even $40,000 for a real-time air monitor to assess pollution from the Cleveland Works. When asked who would have that authority, they said Mr. Mittal. For more, including photos and detailed discharge reports, see: http://www.ohiocitizen.org/campaigns/isg/isgproblem.html. In April 2005, Mittal Steel announced that it would close ISG Research, the onetime Homer Research Laboratories of Bethlehem Steel at Bethlehem, Pa. About 75 employees were to be transferred to a research facility in East Chicago. “These would be some of the best scientific minds in the steel industry today,” said a Mittal spokesman. But as of February 2006, only about 20 employees had relocated, joining about 100 former Inland employees, in part because of a delayed $10-million addition to the East Chicago facility. Should Mittal succeed in its takeover of Arcelor, the R&D activities in East Chicago would be moved to Europe, Lakshmi Mittal has told European authorities. Statement of Aditya Mittal in webcast with analysts, Feb. 23, 2005. From media reports; Aditya Mittal webcast; Mittal Steel N.A., Form 20-F, 2005, to U.S. Securities and Exchange Commission; and Mittal Steel USA, Form 10-K, 2005. Figures come from interviews with informed sources and from company documents. Remember, capex is always a “moving target,” and the amounts allocated may not being spent or unexpected cost overruns may increase the total. From U.S. Steel’s press releases for years 2004 and 2005. This figure is for U.S. Steel’s “domestic” or U.S. mills. The company reported $280 million capex for its eastern European mills in 2005 and $260 million in 2006. ISG took a federal tax benefit (accruing from its 2003 purchase of Bethlehem Steel Corp.), which ballooned its net earnings for 2004 to $1.027 billion. I have excluded this tax benefit in order to give a more accurate comparison of the operating results between 2004 and 2005. Figures taken from Form 20-F, pg. 39, submitted to the Securities and Exchange Commission. Submitted by Norm Roulet on Tue, 07/04/2006 - 17:54. ...and now that you have had a moment to think about the stupidity of that idea... understand that no, I do not feel this way personally about this third richest man in the world, nor do I have anything against global business nor India (I have been there and it is fine) or the wonderful people of India, and I have many Indian friends, so don't get in a huff about suggesting we profile "Indians" of India in a racist fashion... get in a huff about pollution... and, regarding the Cleveland Indians, think progressive and get in a huff about true racism in our community here. Lakshmi Mittal heads the multi national steel company Mittal Steel that his father Mohan began. Mittal has grown the family business into one of the largest steel companies in the world, with steel making facilities in fourteen countries and employing more than 150,000 people. The Indian born, British based steel magnate was the third richest man in the world in 2005 according to the Forbes business magazine. Lakshmi Mittal saw his estimated wealth increase by $US18.8 billion in 12 months, due to surging steel prices and when he merged his Ispat International with Ohio-based International Steel Group. Mittal reportedly paid $US100+ million for a twelve bedroom residence in Kensington Palace Gardens, London. Submitted by Norm Roulet on Tue, 07/04/2006 - 18:52. Besides the obvious conclusion that many friends of the Port Authrority benefit from having a big nasty steel mill in the Flats - shipping and trucking and railing in and out lots of big bulky ore and coal and pollution and such... probably a bit of steel too... it is important to realize the Port Authority used its extreme, "simple and effective" financing powers to provide $23 for ISG, er Mittal, to resume operations... of course they would be involved... I wonder how ISG's William Brake, Vice President & General Manager feels about this accomplishment now?!?! “The financing that secured this project made it possible for ISG to upgrade the Hot Strip Mill at the Cleveland Works plant and retain nearly 1,300 jobs. Working with the port authority was a simple and effective process that will benefit our company, our employees and our region. Submitted by Evelyn Kiefer on Tue, 07/04/2006 - 22:54. Why is Lakshmi Niwas Mittal, head of the Mittal steel empire smiling? Because his $105 million home is nowhere near any of his steel mills. He had his daughter's $55 million wedding at Versailles -- not in a foul smelling, unhealthy place like Cleveland. Read this bio on L.N. Mittal , to learn about the man who is perhaps the single most destructive person to the environment. He probably also deprives more workers of fair wages, benefits, and healthy working conditions than any other employer in the world. His current business strategies are compared to those of Carnegie, J.P. Morgan ... Robber barons who have long been despised for their exploitation of workers and the environment. How can society allow someone to emulate them 100 years later? The robber barons tried to redeem themselves through philanthropy. That may have worked 100 years ago, but Mittal should not be allowed to get off so easily. If L.N. Mittal were a character in Dante's Inferno what kind of hell would he be in? Any insight on Mittal Good Neighbor Campaign? Submitted by Norm Roulet on Wed, 07/05/2006 - 00:39. In my research on Mittal I came across a really excellent site with lots of cool news of Tremont and neighborhood insight on Mittal - The Tremonter - and was surprised to see the name David Nash popping up connected to Mittal... I knew him as founder of Sustainable Cleveland, yet he is attorney for Mittal. As Mittal is not sustainable in our environment in any way, this means Sustainable Cleveland is not about environmentalism, which I had thought it was. Has anyone attended any "Mittal Good Neighbor" activities anywhere - are they just in Tremont or are they in all the neighborhoods Mittal pollutes - is this a sincere initiative by Mittal and/or Nash? Submitted by Norm Roulet on Wed, 07/05/2006 - 01:49. Submitted by Norm Roulet on Mon, 07/10/2006 - 00:06. We are building this site to present Cleveland area community health data in a rich and accessible context. This is a collaborative effort between communities and organizations, both providers and users of health data. ClevelandHealth.info is a partnership to help community members locate and contribute health information for Cleveland, Cuyahoga County and surrounding areas. Cleveland, Cuyahoga County and the Cleveland-Akron-Elyria Metropolitan Area were listed in the American Lung Association's 25 worst locations for air pollution including ozone and particle pollution. The American Lung Association reports annually on air quality in their State of the Air report. The 2006 report is based on data collected by the US Environmental Protection Agency for 2002-2004. Local air pollution rankings are given for ozone and particle pollution (PM2.5, particles less than 2.5 microns in size). Short-term particle pollution represents spikes in the level of dangerous fine particles. The rankings are based on the frequency and severity of 24-hours periods with elevated levels. Cuyahoga County ranked 14th among US counties for short-term particle pollution. For metroplitan areas, Cleveland-Akron-Elyria ranked 10th. The following table provides a comparison with other metroplitan areas in the US. Year-round particle pollution represents background air quality, based on calculated annual concentrations of pollutants. The following table provides a comparison with other metroplitan areas in the US for annual concentrations of particle pollution. Ozone rankings are derived similarly to short-term particle rankings, based on days with elevated levels. The Cleveland-Akron-Elyria Metropolitan Area ranked 16th in the nation for days with dangerous ozone levels. Cuyahoga County was not among the nation's 25 worst counties, however, it received an "F" on its ozone report with an average of 25 "Orange" days (dangerous for vulnerable people) and 4 "Red" days (dangerous for everyone). The American Lung Association Web site provides free access the full State of the Air 2006 report. In addition, it provides a number of links for further information.